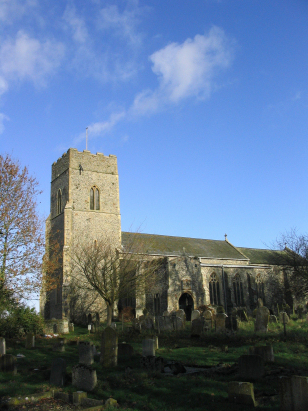 The parish of Catfield lies in eastern Norfolk within the area of The Broads. Catfield is a large village situated just west of the A149 and about 3 miles south of the small market town of Stalham. 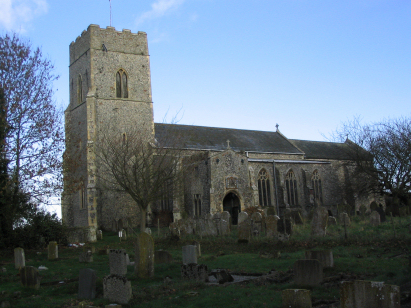 Catfield sits on a narrow neck of land between Barton & Hickling Broads which is also followed by the main road. The land may be slightly higher than that of the water bodies but is still barely 5 metres above the North Sea which lies some 5 or 6 miles away to the northeast. Catfield is still large enough, and indeed has expanded in recent times with modern developments, to retain its facilities and it stretches for nearly a mile along its main north to south axis. The area surrounding Catfield would have once been largely pastures and grazing marsh, nowadays there is more arable farming as the land has been extensively drained. All Saints' church sits away from the village to the west by almost a half mile and close to the grounds of Catfield Hall an 18th century home to the Cubitt family. All Saints is very much a church spanning the fashion divide of Decorated & Perpendicular styles, so much so that each style is intermingled in the patterns of the windows in both nave & chancel. The church follows the standard layout of nave, chancel & western tower augmented by aisles. The earliest part is the tower which Pevsner gives a date in the early 14th century, the nave and chancel span the mid to late 14th century whilst the roofing is of a 15th century pattern. The church has, however, received a series of restorations, in 1864, 1879, 1906, 1913 & 1973 resulting in today's building. Inside the church possesses a suite of 14th century wall-paintings which are certainly worth a visit. The church stands on the southern side of Hall Road at its crossroads with a minor lane, the church sits behind a low flint & brick wall with metal gates to access, the site is fairly open with few restrictions to photography. Two standard 800-entry register books cover the period of this transcript, the second is not pre-stamped with its numbers and the clerk chooses to carry on the numbering from that of the first. The registers are filmed on Microfiche 7 - 9 in the collection of Norfolk Record Office. It must be stated that these fiche are rather poor material to work with. Unfortunately the digitised images, available on both Familysearch and a commercial site, are also very poor indeed. Whilst every care has been taken there are likely to be misreads within this transcript due to the poor quality and the transcriber offers a strong caveat accordingly as to accuracy.